mindbodygreen founder Jason Wachob redefines successful living and offers readers a new life currency to build on, one that is steeped in wellbeing…Wellth. 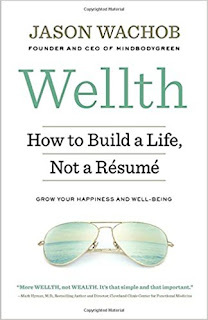 These are the building blocks of Wellth…and in this blend of memoir and prescriptive advice Jason Wachob shows us all how to enjoy truly ‘wellthy’ lives—lives that are deeply rich in every conceivable way. Through his experience and personal story, as well as in exclusive material from popular expert contributors (including Dr. Frank Lipman, Dr. Lissa Rankin, Joe Cross, Charlie Knoles, Kathryn Budig, Dr. Aviva Romm, and Dr. Sue Johnson), we learn how we too can embrace this new movement and develop richer, fuller, happier, healthier, and more meaningful lives. JASON WACHOB is the Founder and CEO of mindbodygreen, the leading independent media brand dedicated to wellness. He has been featured in The New York Times, Entrepreneur, Fast Company, and Vogue. Jason has a BA in history from Columbia University, where he played varsity basketball for four years. He lives in Brooklyn with his wife, and loves German Shepherds, Chuck Taylors, and guacamole. I picked asked to read and review this book as I recognized at least one of the contributors. Then when I read more about the book it sound like it would be something worth reading. 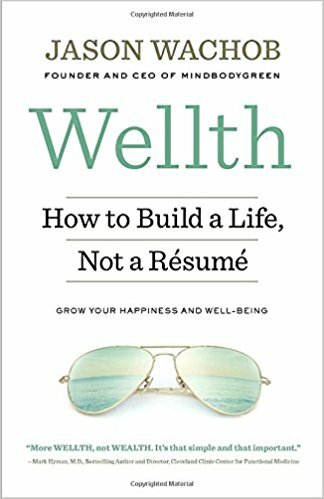 The title makes perfect sense - build a life not a resume. Too many of us do the opposite. For me the writing style of this book made it easier to read. I liked that it was not only a self help type book but a memoir. I agree that each person's life has it's own way of being lived - we are not all the same. This book will help you find your own way of living that is right for you. You must be mindful of what you eat, watch, see and do to make your life the way you want it to be. A good book that should be read more than once to get everything you want out of it. Now I am off to check out his website.